Members of the genus Rhodococcus are specialist in the accumulation of triacylglycerols (TAG). Some of them can be considered oleaginous microorganisms since they are able to produce significant amounts of those lipids under certain conditions. In this context, R. opacus strain PD630 and R. jostii RHA1 became models among prokaryotes in this research area. 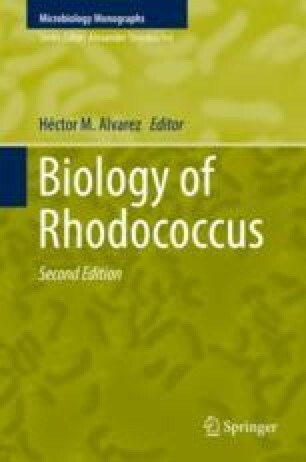 The basic knowledge generated for rhodococci could be also extrapolated to related microorganisms with clinical importance, such as mycobacteria. The biosynthesis and accumulation of TAG by species of the genus Rhodococcus and other actinomycetes seems to be a process linked to the stationary growth phase or as a response to stress. The chemical structure of rhodococcal TAG can be controlled by the composition of the carbon source used. The biosynthesis and accumulation of novel TAG containing unusual components, such as aromatic and isoprenoid fatty acids, by members of Rhodococcus and related genera has been reported. The low specificity of wax ester synthase/diacylglycerol acyltransferase enzymes (WS/DGAT), which catalyze TAG biosynthesis in prokaryotes, may contribute to the high variability of TAG composition. The occurrence of genes coding for WS/DGAT enzymes is highly redundant in rhodococcal genomes. The enrichment of genes and enzymes involved in TAG metabolism in rhodococci suggests an important role of these lipids in the physiology of these microorganisms. Genomic, transcriptomic, and proteomic data from TAG-accumulating rhodococci are now available, and some genes coding for enzymes of the central metabolism, the Kennedy pathway, lipid transporter proteins, structural lipid inclusion body-associated proteins, and transcriptional regulatory proteins have been identified and characterized. This article aims to summarize the most relevant achievements of basic research in this field, including the most recent knowledge emerged from studies on TAG accumulation by rhodococci.